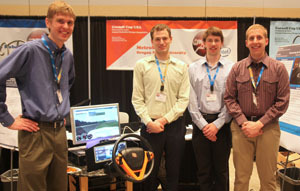 Two Oregon State teams were invited to compete at the Cornell Cup, presented by Intel. Only thirty teams were selected for the national engineering competition that features Intel hardware. Team MoJo² at the Cornell Cup: Jon Shafer, Kyson Montague, and Josh Adkins. Photo by Kai Keane, Cornell University. 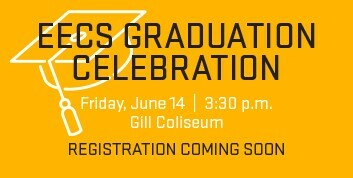 “It’s a great opportunity for the students to compete on a national stage,” said Kevin McGrath, instructor in the School of Electrical Engineering and Computer Science who mentored the teams. “Just making it to the competition shows that they have good ideas. Then they have the opportunity to get feedback from industry representatives about their implementation,” he said. Electrical and computer engineering students, Kyson Montague, Jon Shafer and Josh Adkins, designed an affordable system for homeowners to control lighting, temperature, and home entertainment from a tablet, phone or PC. Sophomore Ryan Kalb, of electrical and computer engineering, teamed up with three seniors in computer science, Steven Reid, Patrick Simonson and David Taylor on a project that reinvents how a car dashboard could look. Their modular system uses a video screen controlled by buttons on the steering wheel. Critical car data, like speed, remain on the screen at all times but drivers can select to display other options like climate or music. Team MetroSwift at the Cornell Cup: Patrick Simonson, Ryan Kalb, David Taylor, and Steven Reid. Photo by Kai Keane, Cornell University. 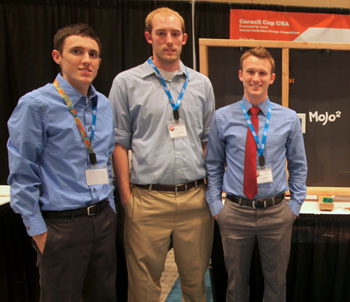 MetroSwift earned honorable mention at the Cornell Cup, and second place for the computer science industry award at OSU’s Engineering Expo. See the MetroSwift project in action in the video below.